CHICAGO – Critics and viewers fell in rapturous adoration of the legend of The Dark Knight when Christopher Nolan and his team took the risk of making character-driven superhero movies. To kick off the second phase of the Marvel Universe of films with this weekend’s “Iron Man 3,” Shane Black and the team behind this guaranteed blockbuster have done the same – presenting us with the most human Marvel flick since “Spider-Man 2.” Also, the best in this series and one of the best Marvel films overall. The quick wit and crisp pacing brought to the Marvel Universe by Joss Whedon remains intact despite a new director (Shane Black). Let’s hope the trend continues through the “Thor” and “Captain America” sequels upcoming. How character-driven is the start of “Marvel 2.0”? “Iron Man 3” is a comic book movie about PTSD. Tony Stark (Robert Downey Jr., giving his best performance since “Tropic Thunder”) is still dealing with the trauma inflicted by what happened in New York in “The Avengers” (and I love the continuity from that beloved film instead of just pretending that it didn’t happen as comic book movies so often used to do). He’s suffering anxiety attacks and spends most days in his lab trying to perfect the newest version of his Iron Man suit, one that comes when called and forms to Tony’s body like magnets thrown at a fridge. With all business mountains climbed and his alcoholic, philandering past behind him, Stark’s main love in life is pure – Pepper Potts (Gwyneth Paltrow), his guide and inspiration. Like a lot of great superhero flicks, “Iron Man 3” will find our hero’s relationship with his gal tested but Black and co-writer Drew Pearce find a way to turn storytelling expectations on their head at every turn, providing the narrative twists that have been missing from this franchise to date. A vaguely Osama-esque villain looms in the international consciousness as The Mandarin (Ben Kingsley) takes responsibility for a series of explosions around the world. As he gets closer and closer to his end game, President Ellis (William Sadler) calls on Colonel James Rhodes aka War Machine aka Iron Patriot (Don Cheadle) to help keep the country safe. When a scientist from Tony and Pepper’s past named Aldrich Killian (Guy Pearce) appears in their office with a heavy named Savin (James Badge Dale) by his side, it becomes clear rather quickly that Killian has a connection to the Mandarin. Killian has developed a technology that allows the body to regenerate, heal, and essentially become invincible. Small problem – it’s not exactly stable. Working with another figure from Tony’s past, a beautiful scientist named Maya Hansen (Rebecca Hall), Killian has discovered something that could change the future and decided to use it for personal gain. If it sounds like a dull plot, don’t worry. First, Kingsley and Pearce make an incredibly engaging team of bad guys, something that’s been noticeably missing from the “Iron Man” movies. For the first time in this franchise, it feels like there’s a notable threat to not just Stark but the world which he inhabits. Most of the first “Iron Man” was devoid of a serious villain as it was origin story and the second film simply dropped the ball in that department (Mickey Rourke on the race track was more bizarre than terrifying). There’s a sense of danger here that Black brings to the piece that most Marvel movies have lacked. He knows how to turn the intensity knob in just the right way, particularly in the action choreography of the final act. 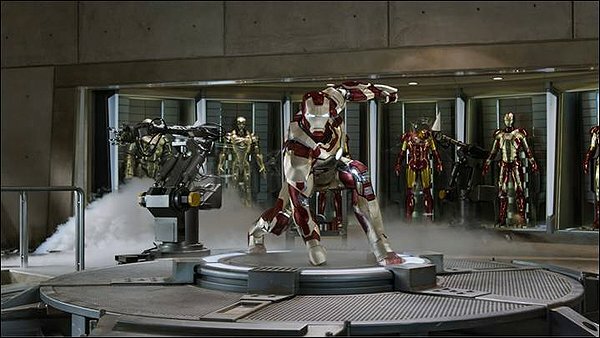 There’s a scene that will heretofore be referred to as “Barrel of Monkeys” that may be the best single action scene in a Marvel film. It’s not only perfectly staged and executed but indicative of the hero model of this universe in its structure. A hero doesn’t just perform the physical acts we cannot, he approaches a challenge from a way that the villain has not conceived, thereby overcoming him. “Iron Man 3” pulses in ways that the other two movies simply did not. Don’t get me wrong. I liked the first film but it was carried on the strength of its remarkably charismatic star. Now, that charisma remains, and has actually deepened through actual character development and romance, but we also have villains that matter, action that feels intense, and supporting characters that crackle right along with their lead. Small roles, like those occupied by Hall, Dale, the always-great Cheadle, and a charming young performance from Ty Simpkins as a kid who befriend and helps his hero in a moment of need, really connect. The Simpkins character is another one who works not only as a piece of blockbuster entertainment but thematically within this world. The kids who love Iron Man don’t just want to be him, they want to help him. He is a role model more than the traditional role for a caped crusader – the icon. “Iron Man 3” isn’t perfect. It takes too long to get going, hits a few too many beats repeatedly, and could have been trimmed by 10-15 minutes. However, there was never an entire sequence, character development, or plot twist that felt wrong (as there has been in every other non-“Avengers” movie). And, most enjoyably, the movie takes narrative twists that you don’t see coming (most Marvel movies have been stunningly predictable). Black, Pearce, and the team chosen to kick off the post-“Avengers” world have succeeded by refusing to play it completely safe, giving fans a film that fits within the universe they know but also deepens it and makes it more rewarding. The most remarkable thing about “Iron Man 3” may be how it makes me more excited for “Captain America 2” and “Thor 2.” That’s downright heroic. “Iron Man 3” stars Robert Downey Jr., Gwyneth Paltrow, Don Cheadle, Guy Pearce, Rebecca Hall, Jon Favreau, Ben Kingsley, James Badge Dale, and the voice of Paul Bettany. It was written by Drew Pearce and Shane Black and directed by Black. It opens on May 3, 2013 and is rated PG-13.